And just like book #1, here is the sort-of epilogue strip. And below is a thank you video for all of you who helped support me during the Kickstarter campaign (and the rest of you too, for keeping my numbers up, spreading the word, and simply enjoying it). Isn’t there also a Medi-Bot? And others? 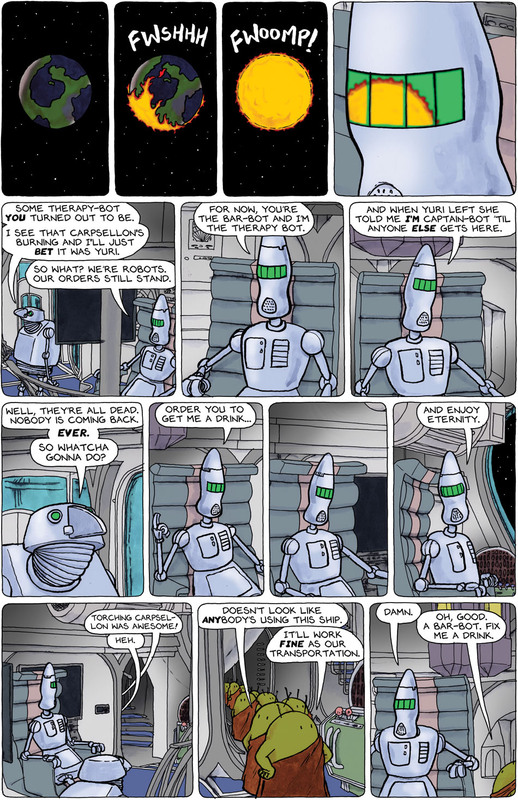 Regarding the use of spacetrawlers: the unclamped, newly-liberated Eebs strike me as the sort who do not particularly care as long as it is not them the bad things are being done to. The Eebs surely don’t really need a bar-bot either, realistically speaking. Can’t they just make their own drinks? What’s funny is it didn’t even occur to me to ponder this. I’m so confident in the fact that beings set on revenge easily rationalize walking on their fallen brothers for the greater cause. The poor creature there inside the ship was also the first I thought about. @AlpineBob, maybe they’ll come up with a version of the greased dark light drive all by themselves. @Christopher, I honestly first read that as, …that’ll be a fun dynamite to touch on. As far as beings that can kill you with their brain, I would MUCH prefer dealing with River Tam (from “Firefly” and “Serenity”) over dealing with a single eeb. The “awwsome” in panel 12, is that a typo or just the way they pronounce it? Welp, a dozen super-powered psychos just took over your ship. Have fun! The Starbanger has been hijacked! Quick, Computer, Destruct sequence 1, code 1-1 A! Just repeating Gillsing’s question about “awwsome” in case Chris didn’t notice it nine months ago.